En aquests moments, els nostres alumnes de 4t d’ESO són a Londres de viatge d’estudis. Museus, palaus, mercats… Aquí teniu, de moment, un avanç. A veure què ens conten quan tornin! Montpellier. Séjour langue et culture françaises. Monsieur le Consul Général de Palma, Michel Magnier, est venu au lycée Son Rullan pour échanger avec les élèves qui ont fait le choix du français. Nous remercions M. Magnier de cette visite!!!! En el sorteig de la cistella de productes ecològics, donada per la família de l’alumne Marc Martín, i d’una sessió d’hidromassatge i dinar al Megasport, ha resultat guanyador l’alumne Pau Llabrés. Enhorabona! Moltes gràcies a la família col·laboradora. The students of AFD21 began the new year going on an amazing trip to the Botanical Garden of Soller. The monitor explained us the different types of habitats that are localized on the Balearic islands; there are more habitats in the garden than in the island, but they focused on Balearic plants such as the typical vegetation of the Sierra, the sandy areas or the rocky coastline, among others. The Botanic Garden´s monitor taught us how they work and how they organize the Garden and proposed a series of activities in small groups that allowed us to understand and expand our knowledge about the Balearic flora and its unique characteristics. For example, autochthonous plant, differences, etc. It´s an institution that dedicates to maintain a collection of alive plants. This allows to investigate, preserve and divulgate them. Specifically, the Botanic garden of Soller was founded in 1992. A habitat is a part of the biosphere with specific ambiental conditions that usually has some species in particular. 1) Collection of alive plants. A part of the garden is opened to the public. Other types of plants from the Mediterranean countries. Ethnobotany flora: Science of orchard plants. 2) Seed bank: Here they keep on the seeds at -18 degrees in order to reduce the humidity and produce a longer life of the seeds. Furthermore, one of their activities is to exchange different kind of seeds with other botanic garden instutions. 3) Herbalist: In orden to maintain pieces of different variety of plants, killing all the bacteries, they give them a cold blow. There are more than 10, 000 pieces. Some of them were dated 250 years ago. 4) Progradation area: Botanist and gardeners make proofs of germination to replant it. 5) Library: Open to their members and even to the public in general. Guanyadores de la gimcana organitzada pels departaments d’Idiomes, Llengua Catalana i Llengua castellana durant la festa de Sant Jordi: Tania Barceló, Isabel de la Calle, Maria Ruiz, Maria Santano, Aina Suengas, Aina Ensenyat, Laura Palomino i Neus garcia de 4t ESO D. Enhorabona! El premi (entrades de cinema) ha estat subvencionat per l’APIMA. A més, el blog és un magnífic itinerari cultural de la ciutat que pot ser molt útil a tots aquells que vulgueu visitar Londres. No us el perdeu. El viatge ha rebut una subvenció de l’APIMA de Son Rullan. We wrote to complain about the refugees situation in Europe. We hope we got an answer! We are writing to complain about the refugees situation. We are students of 3rdESO from a high school called Son Rullan, located in Palma de Mallorca (Spain) We write this letter to you because, even if we are 14 years old, we have the right to give our opinion. A few days ago, our Geography teacher showed us a documentary about the refugees in which we watched how many families suffered for fear of losing their lives risking not to be rescued. Some saw their whole families die in front of them. In their country there is poverty, wars, terrorism and the level of life is very low. They’re forced to leave their homes and flee to survive. We complain because they sacrifice their lives to enter Europe after what they have suffered during a path between life and death. After a terrible experience some lucky people get in and suffer homelessness while the EU is not looking for solutions. We are closing the borders and thus we are condemning them to death. Refugees haven’t got the basic needs to live (food, clothing, home, medicines…) Then, when they get into a country that isn’t at war, they are rejected or expelled from that country to the country from which they come from, because they don’t don’t want to take care of them. The present situation is unsustainable, so we have decided to provide some solutions to the DG of Migration and Home Affairs. The possible solutions we would like to propose you are to build shelters in the EU countries, and giving them a period of 3 months of basic services and to help them to look for a job. There should be a minimum of refugees for every country. We also propose you to reform abandoned houses and offer to them provisionally or to allow refugees to enter countries with population problems, such as an ageing population or a low birth rate. To end, the EU could build homes, camps or shelters for refugees throughout the EU and not only in bordering countries such as Greece, Italy or Macedonia. We are writing to complain about what is happening to the refugees and give you some humble advices on how to solve it. Last week we saw a documentary about refugees fleeing from different places of Africa because war, poverty and terrorism (Boko Haram) There are many shipwrecks that end with the death of hundreds of women, children, and men who flee their countries because of the economic breakdown, war, bad policies, lack of security or diseases. We disagree with the number of rescue boats. 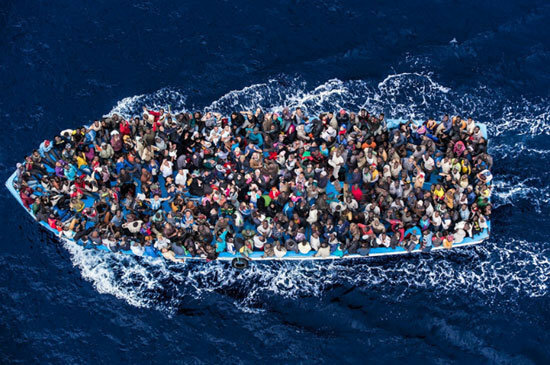 The EU Comission should help with more boats to collaborate with NGO’s and prepare them to rescue refugees. In our opinion there would have to be more reinforcements to save more shipwrecks and we also disagree with not allowing the refugees to pass because every human being deserves to live. Last week we learned that they are paying to Turkey and Libya to have the refugees and keep them out of Europe so they do not travel. Not only that; we also know that during the refugees’ journey from their country to the EU they have very dangerous experiences. Indeed, when they finally arrive in Europe they are treated quite badly. They are treated like criminals and they stay in camps separated from the society. It seems unfair to us that some countries do not allow the refugees to enter and that they have to return to their country of origin, where they have lost everything and they are in danger. It also seems unfair to us that certain countries discriminate them because they are only looking for a better life. They should facilitate the entry of young refugees into the education system give them medical care. -Give them a decent home and facilitate them to find a job in the European Union for a limited time, until they could return to their country. We hope we have helped you. We are students of 3rd ESO at Son Rullan secondary school in Palma de Mallorca. We are writing this letter because we are studying the refugees’ problem and we would like you to solve it. We have been working really hard on this issue in the Social Science class and we think that it is very important to act now to prevent worse situations. As a result of that, we thought that it would be a good idea to write a letter about our opinion on this topic. We know it is very hard to handle this difficult situation, but we want to try our best to help (even if it is just a bit). In the last weeks, we have been working with the news about the refugees to know more about their problems. We have seen some documentaries and we have read newspaper articles. We have concluded that there are a lot of people who cannot have a decent life. Many of them live in countries that are at war or are poor. Those people seek refuge and help because they cannot find it in their countries. For this reason, they decide to leave their country and try to reach another to find new opportunities, but most of them die on the journey or are saved by volunteers who risk their lives to help them. We have also read that the EU must help them but that you are not helping them and, even, putting obstacles to a possibility to get a new life. It is not fair that you pay other countries like Libya or Turkey because you do not want them to come into Europe. They deserve a new life like ours, so we want to propose some solutions. In the first place, we propose you to invest the money you are now paying to the transit countries in having more protection in borders and frontiers and building more refuges in good conditions (food, health…) for the refugees who are already in Europe and for the people who are planning to come here. In the second place, we propose to send more ships for humanitarian aid in search of the refugees lost in the middle of the sea. Finally, on the one hand, one short term solution is to use the houses that banks own to shelter refugees because they are empty. Another possible solution is to give them food in exchange of a work. On the other hand, a long term solution is to find a solution to these conflicts so that the refugees can come back to their countries of origin. Thank you very much for reading this letter. We would like you to consider our suggestions.